Deleting your user account removes all repositories, forks of private repositories, wikis, issues, pull requests, and pages owned by your account. Issues and pull requests you've created and comments you've made in repositories owned by other users will not be deleted. If you’re the only owner of an organization, you must transfer ownership to another person or delete the organization before you can delete your user account. If there are other owners in the organization, you must remove yourself from the organization before you can delete your user account. Before you delete your user account, make a copy of all repositories, private forks, wikis, issues, and pull requests owned by your account. 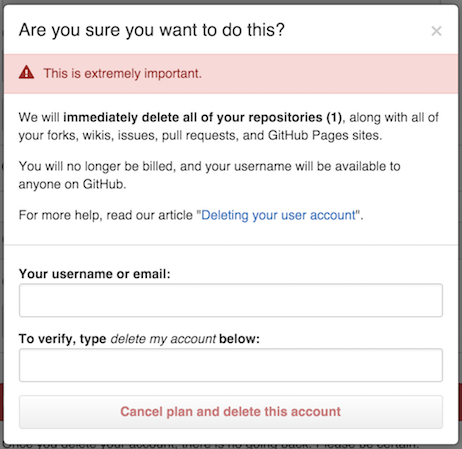 Warning: Once your user account has been deleted, GitHub cannot restore your content. If you're the only owner in the organization, you must transfer ownership to another person or delete your organization. If there are other organization owners in the organization, you must remove yourself from the organization. Recall that all repositories, forks of private repositories, wikis, issues, pull requests and pages owned by your account will be deleted, and your username will be available for use on GitHub Enterprise. 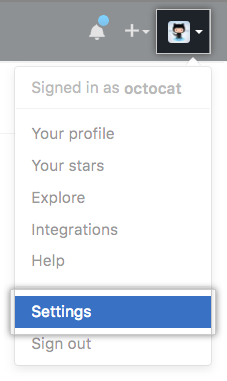 In the first field, type your GitHub Enterprise username or email. In the second field, type the phrase from the prompt.